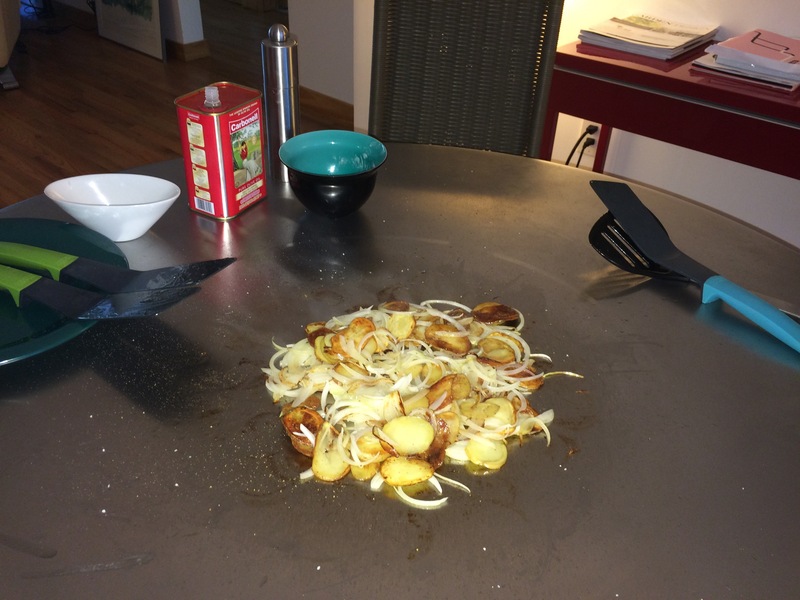 Crispy Potatoes, Teppanyaki-style – Teppanyaki Beyond Stir Fry. Autumn is in full swing and even though the weather in Miami may not know it yet, my taste buds sure do! 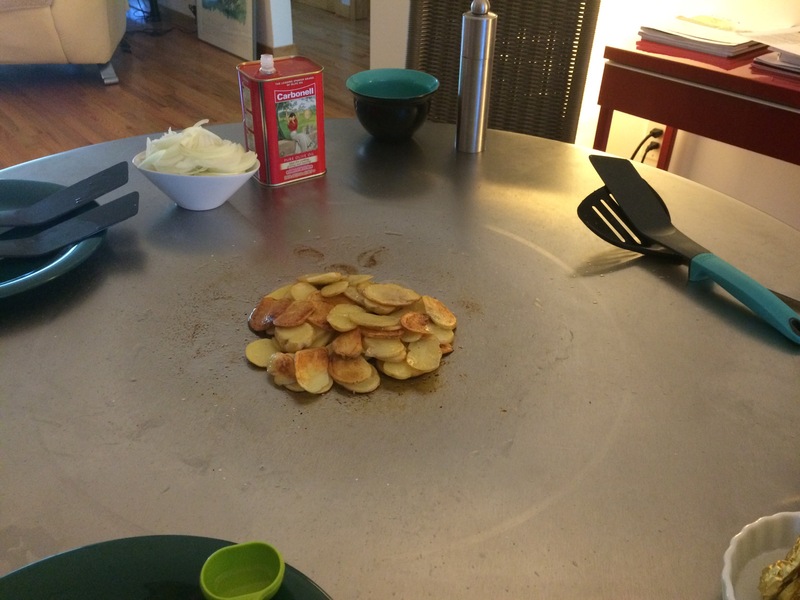 Craving some earthy and yummy potatoes, we decided to try out a new recipe on the Cook-n-Dine Teppanyaki table. 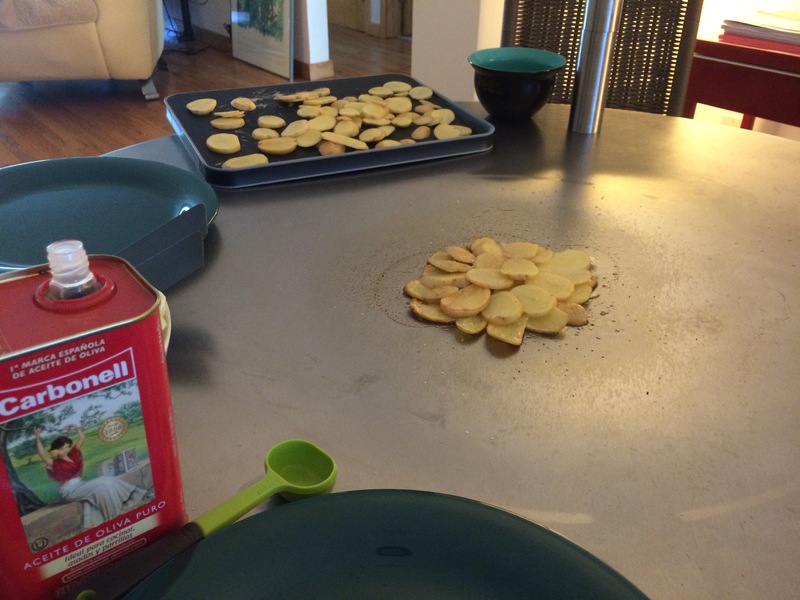 As you can see in the photo, it was a pretty easy and minimal set up of utensils and ingredients; just some small yellow potatoes, yellow onions, olive oil, a little butter, sea salt and fresh cracked white pepper, along with a measuring spoon and a couple of nylon spatulas. We chose the small yellow potatoes for two reasons, one is so that we could leave the skins on for the extra flavor and nutrients, and the other was for the texture which has a nice amount of moisture with a subtle sweet and buttery taste. When slicing the potatoes try to get them pretty thin and even, because you will be layering them and want to allow the potatoes to not only cook but lightly brown as well. It’s all about that crispy crunch factor with these! As for the onions, slice them lengthwise and pretty thin as well; this way they will stay together but fan out to give you that onion string texture without burning. For the Cook-n-Dine, preheat on the number 5 setting. After a few minutes when you see the heating light turn off, you can turn the temperature up to number 8. If you are preparing this in a skillet, we would recommend medium-high heat. Once your surface has been heated to the appropriate temperature, add 1 tablespoon of oil to the center and then layer 1/3 of your potatoes in a flowering circle. Season with a small sprinkle of sea salt and white pepper, then allow the potatoes to cook for about 2 minutes. 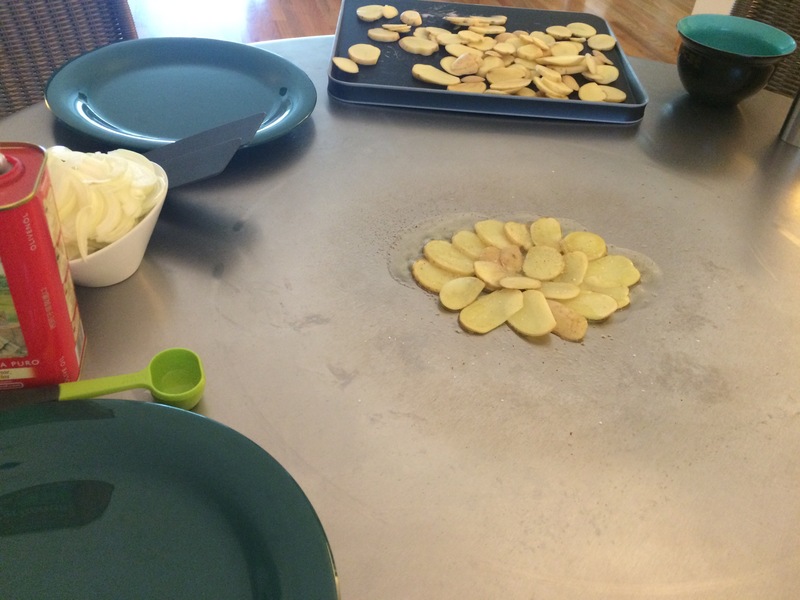 If it appears the first layer of potatoes have used up the majority of the first pour of oil, add a little more to the top before placing your second layer of potatoes in another flowering circle. Season the top of this layer with another small sprinkle of sea salt and white pepper, allowing them to cook for another 2 minutes. Repeat layering and seasoning once more for the final layer of potatoes, remembering to add oil if needed before laying them upon the other potatoes. Allow the potatoes to now cook for about 5 minutes, so the bottom layer starts to turn slightly brown while getting that nice crisp we are looking for. 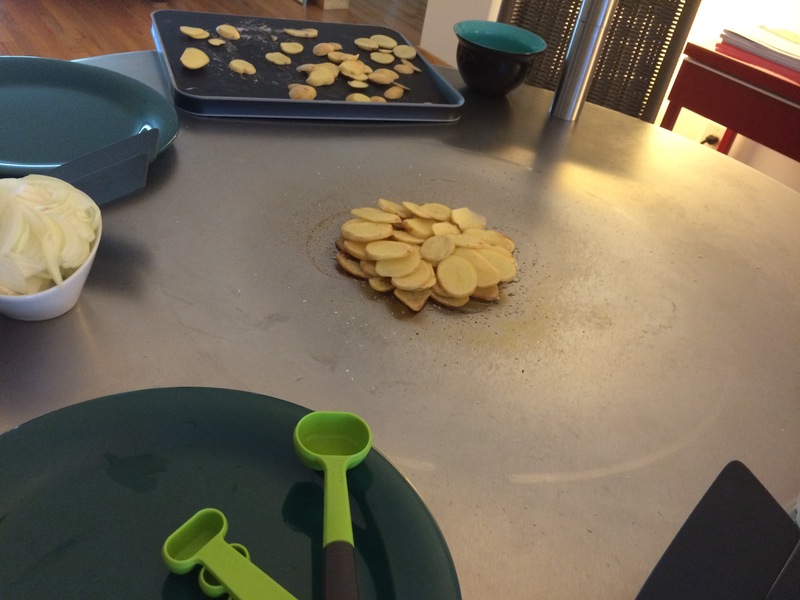 After that, use the spatula to start turning the potatoes over so we can start crisping the other side. This is where the real fun starts on the Cook-n-Dine table! 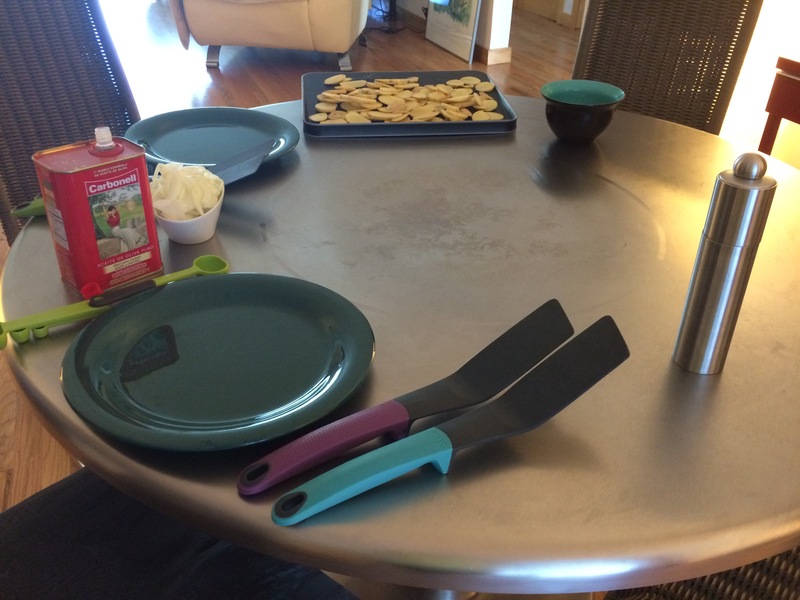 Two people at the table, two spatulas, tons of fun turning potatoes while talking about how delicious they are smelling! We allowed about five minutes of cook time after the first flip, then flipped some more and gave the potatoes another five minutes. There’s a heating that occurs inside the layers of potatoes, so even as we are getting that nice brown crisp on the outside, the inside of the potato slices were getting perfectly tender. Once the potatoes were a pretty golden brown, it was time to add some butter and get the onions cooking! We divided a tablespoon of butter in 3 parts and placed them all around the potatoes so that it would melt and distribute evenly before adding our first half of the sliced onions over the potatoes which we then seasoned with a touch of sea salt and white pepper before flipping over so that this first layer of onions would cook under the potatoes for about 2-3 minutes. 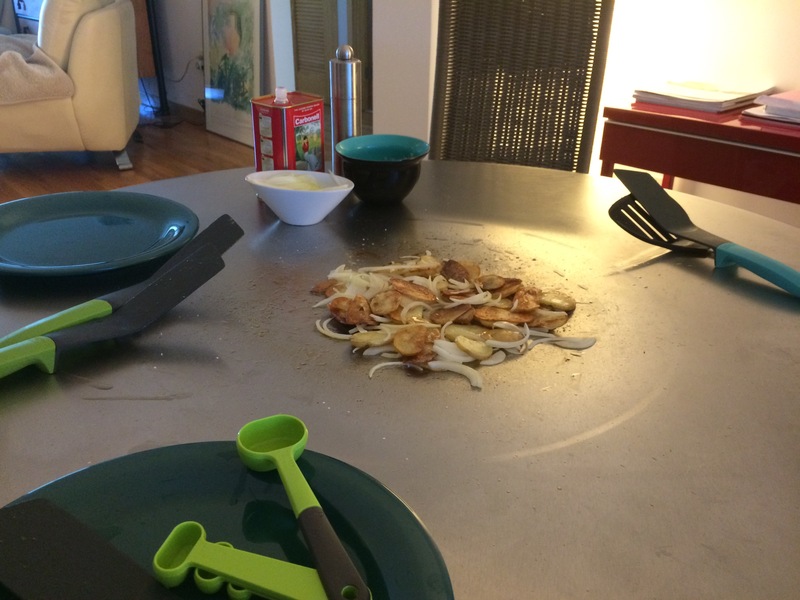 After that we added the second half of the onions, seasoning them lightly with the sea salt and white pepper, and then proceeded to flip the potatoes and onions for just under 10 minutes. The onions were caramelized and cooked without one single burned onion in the bunch! Time to enjoy the fruits of this fun and delicious labor of love! We added a few snips of fresh chive on ours, you can add some sour cream or even shredded cheese to yours if you would like. I highly recommend the white pepper over black pepper, it added such a beautiful and delicate taste that was almost floral in contrast with the onions. Not only was this dish super fun and easy to prepare, it was delicious to sit and enjoy with my friend. Bonus of the Cook-n-Dine: clean up was a cinch! Just a little water, low heat and elbow grease got that teppanyaki ready for another round! Even though I prepared this on a Cook-n-Dine teppanyaki table, you can use the same recipe for a skillet. We hope you enjoy it as much a we did! Clean up as easy as 1, 2, 3! – Teppanyaki beyond stir fry. Oktoberfest, Teppan-style! – Teppanyaki Beyond Stir Fry.